VOIGTLANDER 40mm f/2.0 Ultron Asferica Obiettivo Pancake Nikon AI-S. EXC-COND. Voigtlander 40mm f/2.0 Ultron SL Aspherical Nikon Ai-s pancake lens. In EXC- condition. Lenses would be optically clean. Lenses may have dust and minor optical blemishes, which wouldn't affect image quality. •Two focus modes: M/A (manual-priority autofocus), allows quick switching between Autofocus and Manual focus operation, and M (manual focus). When mounted on a DX-format SLR, the picture angle is equivalent to a focal length of about 60mm in 35mm format. The Tamron SP 85mm F1.8 Di VC USD is the world's first 85mm fast-aperture lens with image stabilization. Tamron SP 85mm F1.8 Di VC USD Lens Specifications Plus the working distance between you and your subject is perfect for making the personal connection that's often missing when using a zoom. Nikkor 50mm f/1.4 SC auto ai convertiti Obiettivo con messa a fuoco manuale. EXC +++. vedere TST foto. Nikon Nikkor 50mm f/1.4 SC AI Converted Manl Focus Lens. See test pics. This was in fact the first Nikkor 50mm f/1.4 to enjoy Multicoating. The SC Auto Non-AI 50mm f1.4 lens was made by Nikon Japan between 1973 and June 1974. Asahi PENTAX Super-Takumar 55mm f/1.8 Lens M42 Mount. EXC + + condizioni. GRANDE! EXC condition. Includes lens hood, and filter. In excellent EXC condition. Nice smooth focus action. Lenses would be optically clean. Lenses may have dust and minor optical blemishes, which wouldn't affect image quality. Asahi PENTAX Super-Takumar 135mm f/3.5 Lens M42 Mount. EXC + + condizioni. GRANDE! The lens is used but like new works perfectly and has been well looked after. Hood is built in. Autofocus works. Samples are taken on my D600, very quick grab shots using a monopod at 1/250 f8, down my driveway at three focus points. In Nikon (non Ai) mount. We are located 10 minutes from Junction 37 of the M62 in East Yorkshire. Nikon 10.5mm F/2.8 DX AF ED G Lens. Nikon 10.5mm 2.8 lens. Is a great fun lens to use and is a must have in any photographers bag. Yongnuo Digital YN 35mm F2 N Autofocus Lens for Nikon. This lens is in excellent condition throughout & fully works. The lens exposes correctly through the F stop range and there are no issues / faults with the lens. Nikon 35mm f/1.4 Nikkor AIS lens, MINT- condition. MINT Totally unmarked. MINT- Almost unmarked, only very tiny rubs. Serial no. 602211. The focus operates smoothly. There is no backlash, slop or play. Tokina 100mm F2.8 ATX-PRO Macro Lens. Nikon AF fitting. Nikon 50 mm AF f/1.4 DSLR Lente. D utilizzato, In buonissima condizione, Gratis Uk Post. Hello and thanks for looking. You are buying a used Nikon 50mm 1.4D DSLR lens, complete with front and rear caps and in the original box with instructions. The lenses condition is used but looks like new. It works perfectly and has been well looked after. The lens works fine on both manual and autofocus. These are superb prime lenses, pin sharp. They sell for over £300 used on Amazon, and get 4.5/5 stars. It will be delivered for free anywhere in the UK by trackable courier, or extra for Royal Mail first class recorded or guaranteed next day delivery. A bargain at 99p starting bid and no reserve, happy bidding! Hello and thanks for looking. You are buying a used Sigma 105mm DX Nikon fit macro lens, the optically stabilised version, complete with front and rear caps and lens hood. The lenses condition is used but looks like new. It works perfectly and has been well looked after. It works fine on both manual and autofocus. The OS function works perfectly too. It comes in the original padded Nylon pouch. These are superb lenses for a reasonable price. They sell for over £300 discounted on Amazon, and get 4.6/5 stars. It will be delivered for free anywhere in the UK by trackable courier, or extra for Royal Mail first class recorded or guaranteed next day delivery. A bargain at 99p starting bid and no reserve, happy bidding! Nikon Nikkor 50mm 1.4 AF made in Japan! It has never been dropped or banged and has spent most of its life in my care in a padded case in a wardrobe. 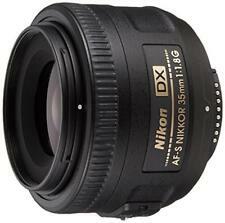 I have used it as an excellent portrait lens on Nikon DX bodies as well. I bought this lens used in London eight years ago and I have used it with excellent results. Condition is Used. Nikon AF-S Nikkor 300mm f/2.8 ED II Lens perfect working order. Nikon 50mm f/1.8 Nikkor AIS lens, EXC condition. MINT Totally unmarked. MINT- Almost unmarked, only very tiny rubs. VG Heavily used but still working. EXC Very minor signs of use only. Gradings guide. 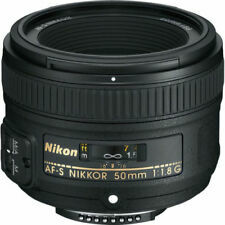 Nikon Nikkor 50mm f/1.4 Ai-s fast standard lens. "This lens has just about the best performance you can get for your Nikon.". A fantastic lens in perfect MINT- condition. Focus pull smooth as new. Nikon AF-Nikkor 50mm f/1.8 Ai-s auto focus zoom lens. Includes Nikon lens cap front and rear and Hoya Skylight filter and lens hood. In excellent EXC condition. Focus and zoom pull smooth. Lenses may have dust and minor optical blemishes, which wouldn't affect image quality. Nikon 135mm f2 D AF DC lens. A unique lens desin exclusive to Nikon. The lens has a built in lens hood. Nikon Nikkor AFS 85mm f/1.8G Lens. Excellent condition rarely used. Dispatched with Royal Mail 1st Class. Nikon Nikkor 50mm f/1.4 non-AI Super SHP LUNARI Focus Lente. EXC + +. vedere TST foto. Nikkor 50mm f/1.4 Non-AI Manual Focus Standard Lens. This is an immaculate example of one of Nikon's high quality Pre-AI lenses from the 1970's and 1980's when Nikon didn't make anything except high quality pro lenses. Nikon 50mm F1.2 AI. A legendary lens the 50mm F1.2 the fastest lens in it’s class. The key to fast lenses is not just the light transmission its the fact the lens when shot at wide apertures F2.8- 1.2 the subject takes on a wonderful artistic quality, the subject stands out against a very out of focus background. Aperture blades clean and snappy. focus ring smooth all in all a great lens. Condition is Used. Ha rd ly u se d as I ma in ly s ho ot l an ds ca pe s. th an ks f or l oo ki ng. Nikon AF Nikkor 50mm 1:1 .4 - "Obiettivo D CONDIZIONI FANTASTICHE"
Nikon AF Nikkor 50mm 1:1.4 D Lens - "brilliant condition". Condition is Used. Bought in Tokyo when on holiday. Have moved to Lumix so selling old glass. Nikon 1987 60-60mm F/2.8 D AF Lens. Dispatched with Royal Mail 1st Class. This is a really beautiful example of one of Nikon's high quality lenses from the 1970's and early 1980's when Nikon didn't make anything except high quality pro lenses. We can therefore be fairly sure that this lens was made around April 1971. NIKON PC-NIKKOR 35MM 2.8 PERSPECTIVE CONTROL SHIFT LENS. Used condition. Beautiful old Nikkor shift lens, in excellent used condition as shown. Focus is smooth, iris is perfect, and optics are spotless. A relatively rare chance to own this fantastic specialist piece of glass which comes with box (without insert), spare lens cap, and a Canon EF manual adapter. Similar examples with more wear and tear sell for £300 when the box is included, and I’m also including a Nikon F mount to Canon EF manual adapter and a spare generic lens cap. Buyer is responsible for any customs duties / import tax. Nikon Nikkor 135mm f/3.5 Ai. EXC-condizioni. teleobiettivo fantastica! In EXC- condition. Lots of scratches, rubs and marks to optics, which under normal circumstances will have little or no effect on the final image. Lenses would be optically clean. Lenses may have dusty and/or optical blemishes which shouldn't affect image quality. Nikkor 24mm f/2.8 AI SUPR SHP MN "Fcs AI Lente L. in SCATOLA NR. Nuovo di zecca vedere TST foto. This is a near mint example of one of Nikon's high quality AI lenses from the 1970's, 1980's and 1990's when Nikon didn't make anything except high quality pro lenses. We can, therefore, we can be pretty confident that this lens was made around January 1981.